The Oppo F7 after grabbing much of attention for being latest selfie-centric smartphone has been finally launched by the company. The gadget is priced at Rs. 21,990 for 64GB option and Rs 26,990 for 128 GB option. With the launch, the Oppo F7 is another smartphone in a line with a bezel-less display. On the other hand, the Vivo V9 is available with the same design, selfie-centric camera and resemblance with the display as well and priced at Rs 22,990. Further, the Apple iPhone X also the bezel-less display smartphone and have almost similar functioning. With the launch, the question can be in your mind that which one is better among the two. 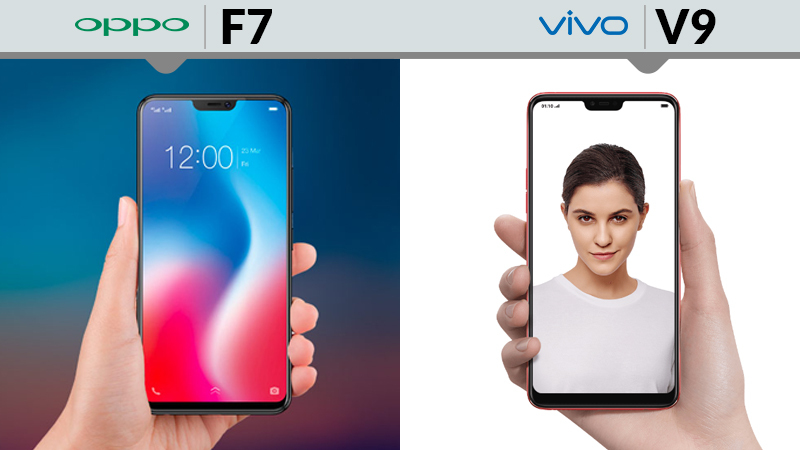 To resolve your problem, here is the comparison between Oppo F7 vs Vivo V9. Concerning the camera, the Oppo F7 takes a 25-megapixel selfie camera along with AI Beauty Technology 2.0, real-time preview, bokeh effect, and AR stickers. The rear side is placed with a 16-megapixel camera along with LED flash. The Vivo V9 takes dual rear cameras along with 5-megapixel and 16-megapixel sensors with LED flash. At the front end, it has a 24-megapixel camera with a wide-angle lens. It also has AR Stickers and AI faces beauty. The Vivo has stepped up from Oppo F7 with the dual-camera setup at the rear. Although, the selfie camera has the almost similar specs in megapixel count. Therefore, the dual-camera setup in Vivo V9 leads in the camera race. So it is clear that Vivo V9 camera quality is better than Oppo F7 camera. The Oppo F7 and Vivo V9 sport a notch on the top for the front-facing camera and they look similar as well. They own the same bezel-less display and same shiny finish at the rear. The difference can be seen by spectators at the back panel only. 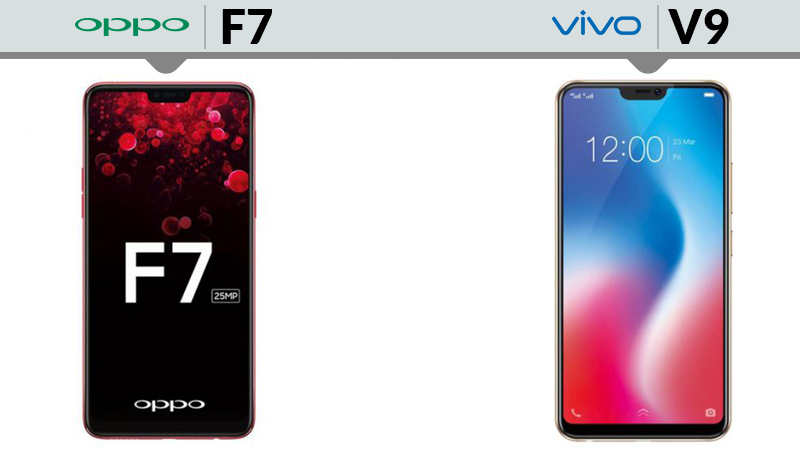 The Oppo F7 is 7.8mm thin, weighs 150 grams, whereas the Vivo V9 is 7.89mm thin and weighs 158 grams. Concerning the design, both have approximately similar specs. The Oppo F7 takes a 6.23-inch Full HD+ display in relation to the screen resolution of 2280 x 1080 pixels, 89.9 percent screen-to-body ratio and aspect ratio of 19:9. On the other hand, Vivo V9 comes equipped with a 6.3-inch Full HD+ display in relation to the same screen resolution of 2280 x 1080 pixels, and 90 percent screen-to-body ratio. Therefore, in display and design, both smartphones are equal. Both the gadgets run on the same Android 8.1 Oreo. 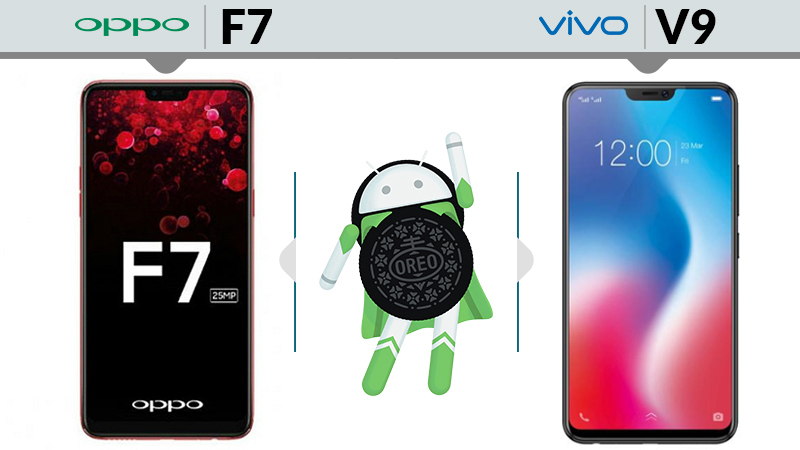 The Oppo F7 has Color OS 5.0 while Vivo V9 has FunTouch OS 4.0. The Oppo has AI integration along with AI-centric features to make it perform faster than the predecessor. The Vivo V9 has AI Smart Engine and AI features, which help the app in storage management and monitoring app usage. So, it is again a tie between the two when concerning software comparison. The Oppo F7 takes power from an octa-core MediaTek Helio P60 processor, 2.0 GHz clock speed, and Mali-G72 MP3 GPU. Whereas the Vivo V9 takes power from an octa-core Qualcomm Snapdragon 626 processor, 2.2GHz clock speed, and Adreno 506 GPU. Both the gadget takes similar RAM of 4GB and internal storage of 64 GB. Comparing both the smartphone in Hardware specs, Snapdragon 626 processor is more powerful. Further, Vivo has a better implementation of AI in a smartphone. With the Helio P60, better FinFET technology and a dedicated Neural SDK are the advantages. 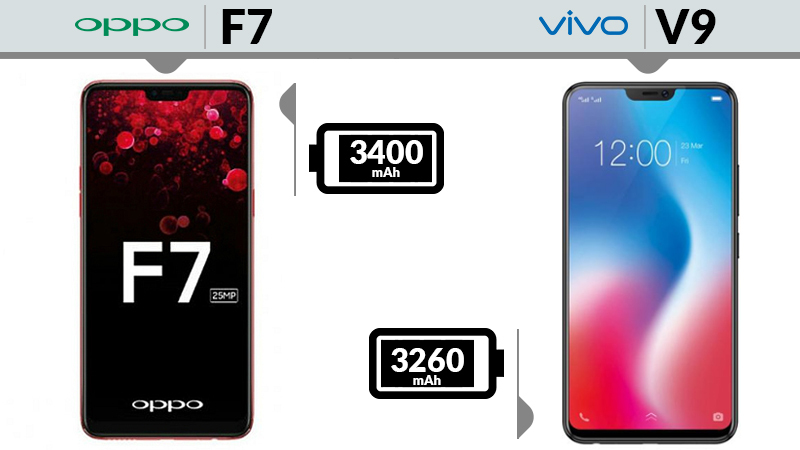 Talking about battery specs, the Oppo F7 has a 3400mAh battery along with fast charging facility and the Vivo V9 has a 3260mAh battery. Here, the battery backup is slightly stronger in Oppo F7. Concerning connectivity options, both the handsets have Bluetooth v4.2, Wi-Fi 802.11 a/b/g/n/ac, 4G VoLTE, GPS, dual-band and WiFi Direct. Read Also: OnePlus 5T V/S Pixel 2: Which Is Best For You? 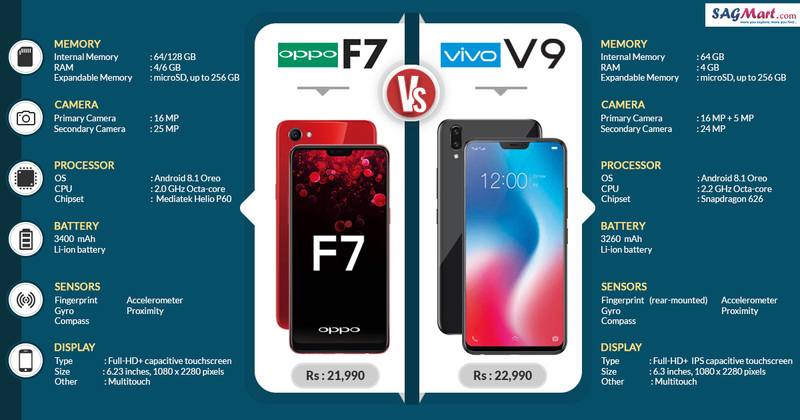 After comparison between Vivo V9 vs Oppo F7, it is hard to find much difference. They are approximately the same from the outside to the inside. 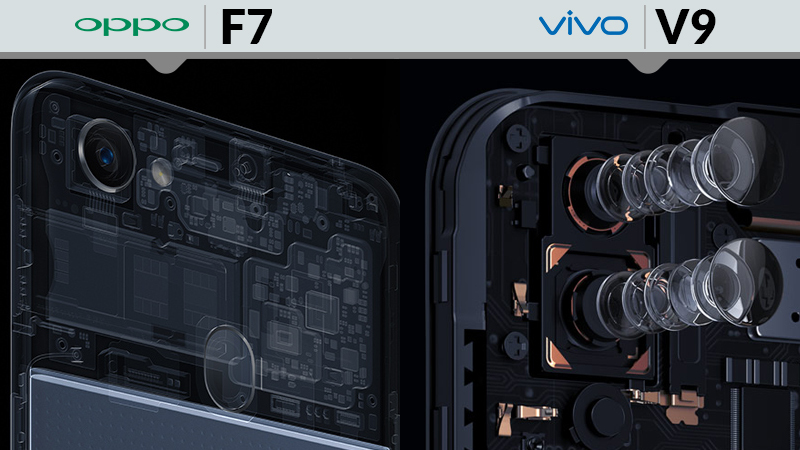 Where the Oppo F7 has an advantage of the processor, Vivo leads in camera department with the addition of dual-camera setup. So, it majorly depends on the buyer’s concern that what is their priority. If they find the camera more related, Vivo V9 can be the choice and similar to the Oppo F7’s processor as well.